These simple, delicious grilled burgers are made with fresh garlic, a little grated onion, and a few teaspoons of Worcestershire sauce. Serve these flavorful hamburgers on grilled or toasted buns with your favorite potato salad, sliced tomatoes and onions, dill pickle slices, and condiments. They make delicious sliders, too! I've included some variations and spread ideas below the recipe. Combine all ingredients in a bowl and blend well. Shape into 4 to 6 hamburgers. Cover and chill until you're ready to grill. Serve with hamburger buns, condiments, and toppings, along with potato salad or other summer sides. Replace the salt and pepper with 3/4 teaspoon of Cajun seasoning or a grill seasoning for ground beef. 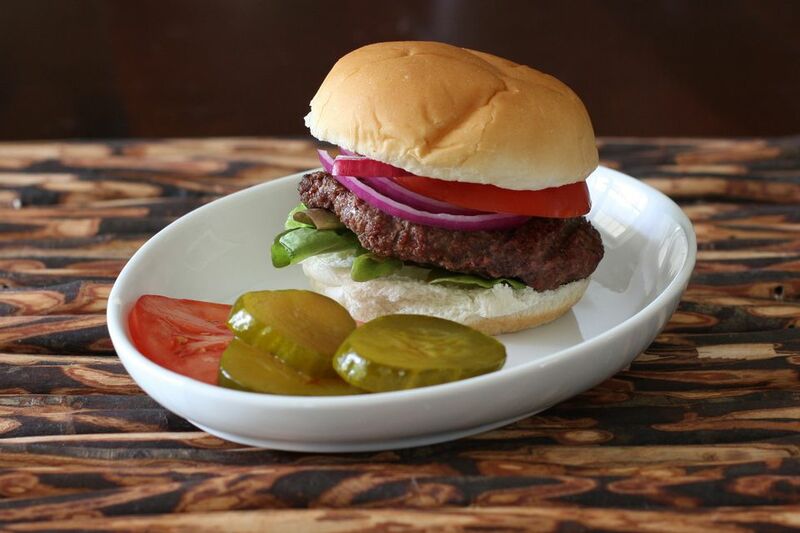 Shape eight to twelve 2-ounce burgers for sliders and serve on toasted or grilled slider buns. Secret Sauce - Combine 1/2 cup mayonnaise, 1 1/2 tablespoons of sweet pickle relish, 1 teaspoon onion powder, 1 teaspoon vinegar, 1 teaspoon sugar, and 2 tablespoons of French dressing. Add salt, to taste. Sriracha Mayonnaise - Combine 1/2 cup of mayonnaise with 2 tablespoons of Sriracha sauce and 1 teaspoon of lime juice or lemon juice. Optionally, add 1 teaspoon of chili-garlic paste and/or chopped cilantro. Chipotle Mayonnaise - Combine 1/2 cup of mayonnaise with 2 tablespoons chopped chipotle peppers in adobo, 1 teaspoon of lime juice, garlic powder, to taste. Optionally, add a few teaspoons of chopped cilantro and a chopped green onion.